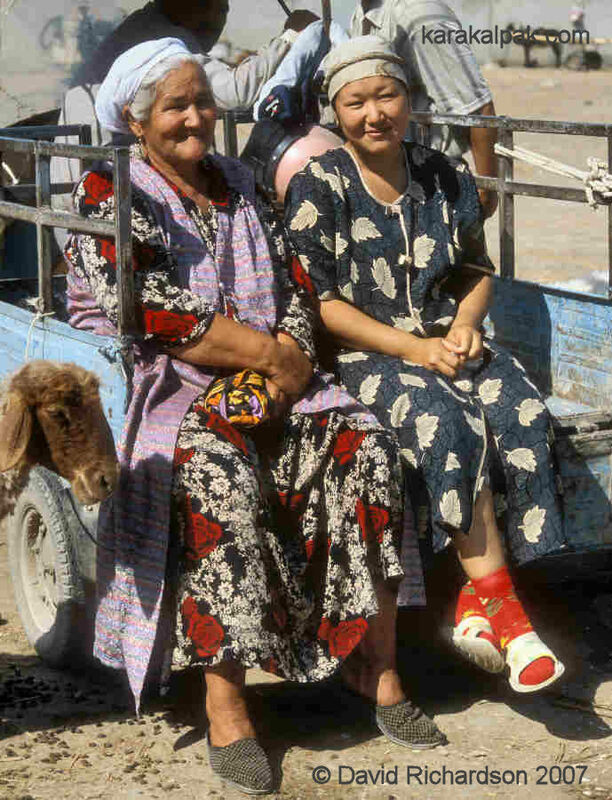 The costume of Karakalpak women has changed markedly over the centuries. 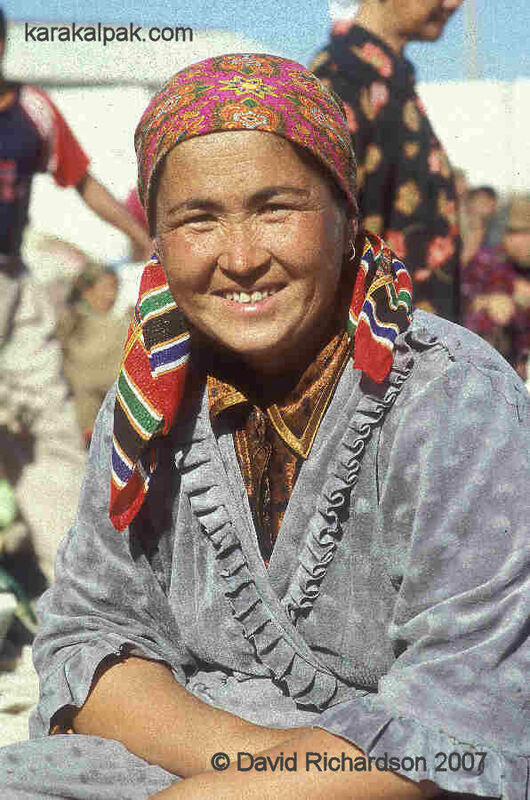 In the past the Karakalpaks had a distinct and colourful material culture – undoubtedly Turkic in origin yet uniquely Karakalpak. This began to change as the Karakalpaks moved into the Amu Darya delta, coming increasingly under the influence of the Khorezmian Uzbeks and, to a lesser extent, the northern Turkmen. Karakalpak women gained access to new materials and learnt new techniques. They adopted the Uzbek shapan and the chyrpy-like jegde. At the same time they continued to evolve their own unique garments, such as the kiymeshek and decorative jen'se oversleeves. Karakalpak female fashions underwent a major revival in the early Soviet period as agricultural development forced women into the workplace and higher cotton prices gave them a limited degree of economic independence. Young women were required to leave their homes to undertake backbreaking work in the fields. They soon had little energy or time for weaving or embroidery. Russian costumes became increasingly fashionable and the availability of brightly coloured and inexpensive Russian cotton prints made it easy for women to sew jolly dresses and trousers. 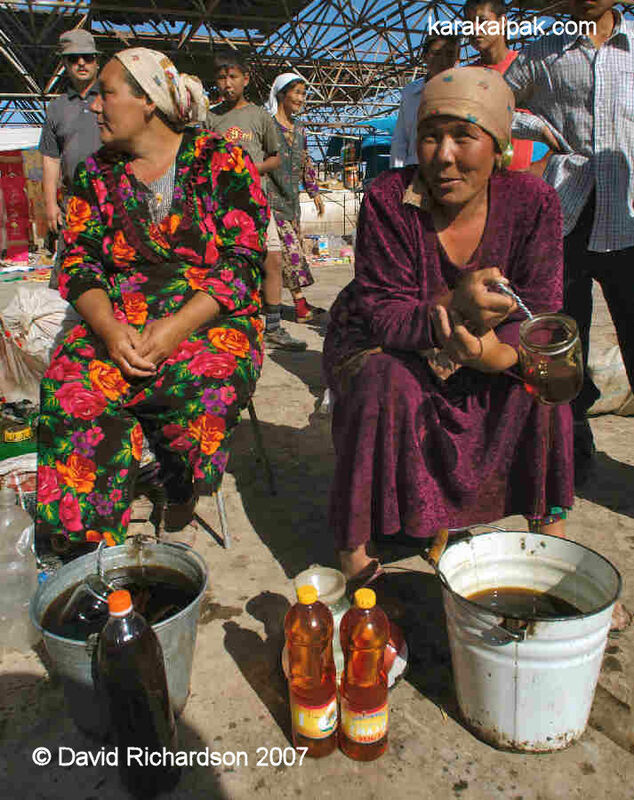 Cheap Russian factory-made clothes also appeared on local bazaars. As a consequence the wearing of traditional costume steadily died out throughout the 1930s. By the end of the Great Patriotic War, Karakalpak female costume retained only a few traditional remnants, such as the limited use of embroidery on collars and sleeves. Today virtually all Karakalpaks wear modern Western clothes. Only a few remnants of traditional culture remain. 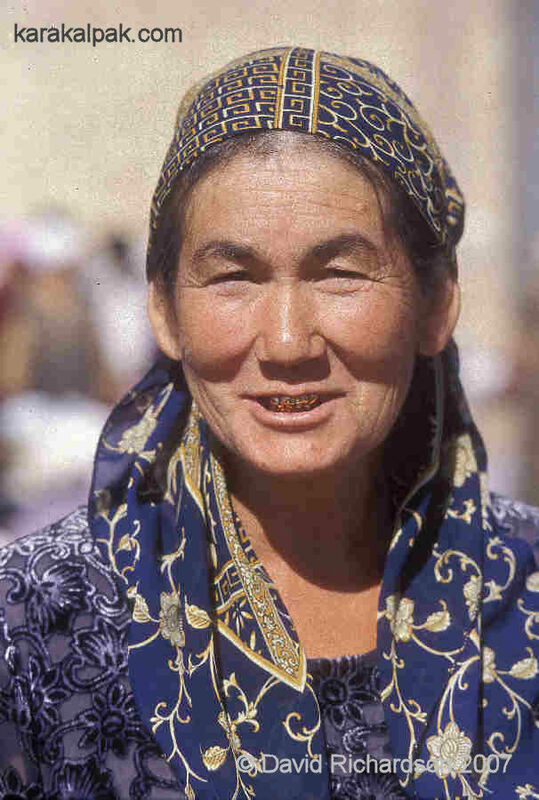 Many girls and women still wear a headscarf, which is a relic of the former bas oramal or ma'deli headdress. Costume remains conservative, with dresses worn long. Sleeves are traditionally long, but younger women are increasingly seen in short sleeves in the summer. Young women aspire to be married in the ubiquitous Western white wedding gown, a status symbol for the modern bride. a chain-stitch qızıl kiymeshek, and a qızıl tu'rme headdress. 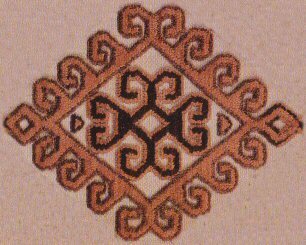 From "Karakalpak People's Embroidery", 1977, by Ag'ınbay Allamuratov. 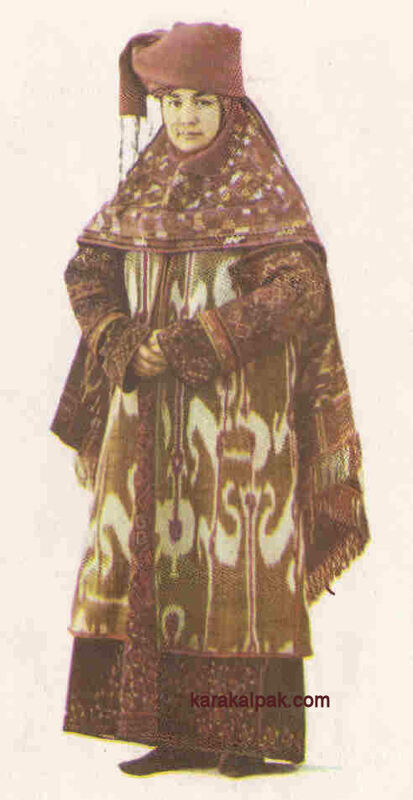 Karakalpak model dressed in the costume of a wealthy bride. Note the jen'se oversleeves and the aq jegde cloak. Image courtesy of the State Museum of Art named after Savitsky, No'kis. The same model shown in full length costume. She wears a pashshayı ko'ylek, a pashshayı shapan with jen'se, a bas oramal turban, an aq jegde, and a huge amount of jewellery. 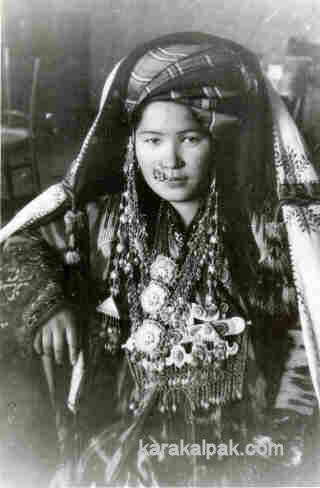 Another Karakalpak woman dressed in bridal costume. Around 1930. This woman wears another pashshayı ko'ylek with jen'se oversleeves. 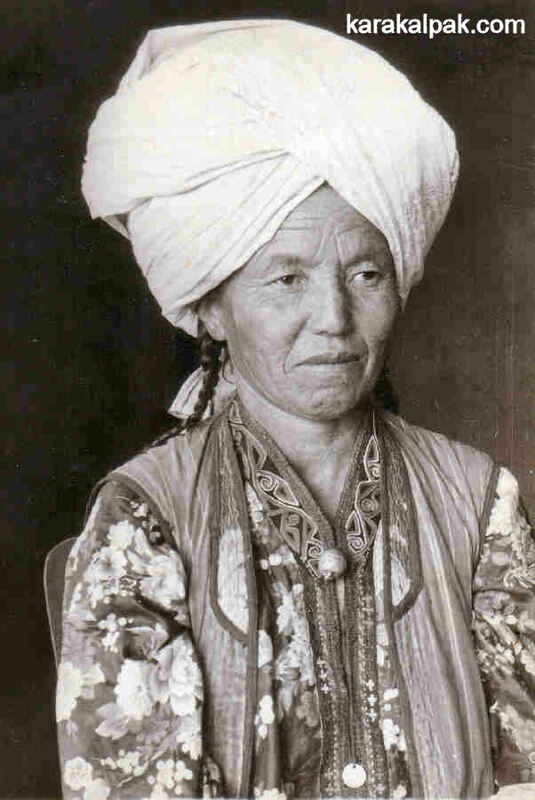 She has a bas oramal turban and a fairly rare pashshayı jegde. 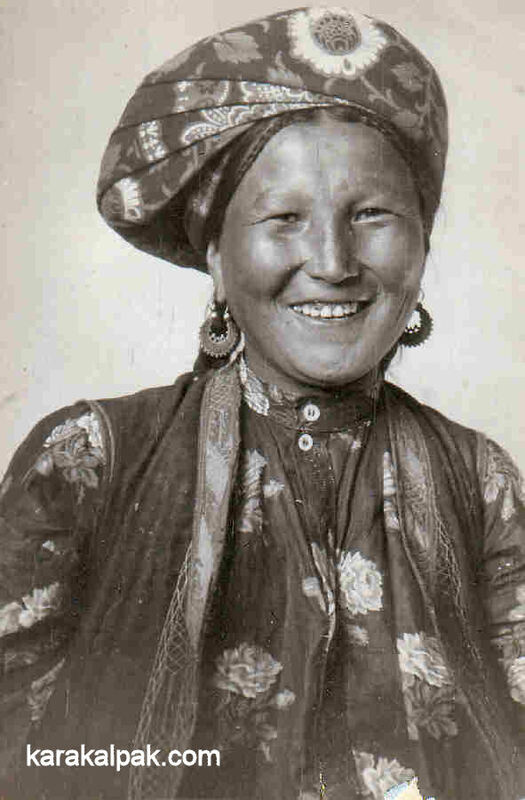 Karakalpak woman in everyday clothing in the mid 1930s. The bas oramal remained popular throughout the 1930s and was tied in different ways from village to village. Note the traditional chain-stitch embroidery on the collar of the printed cotton ko'ylek. and had no time for embroidery or weaving. 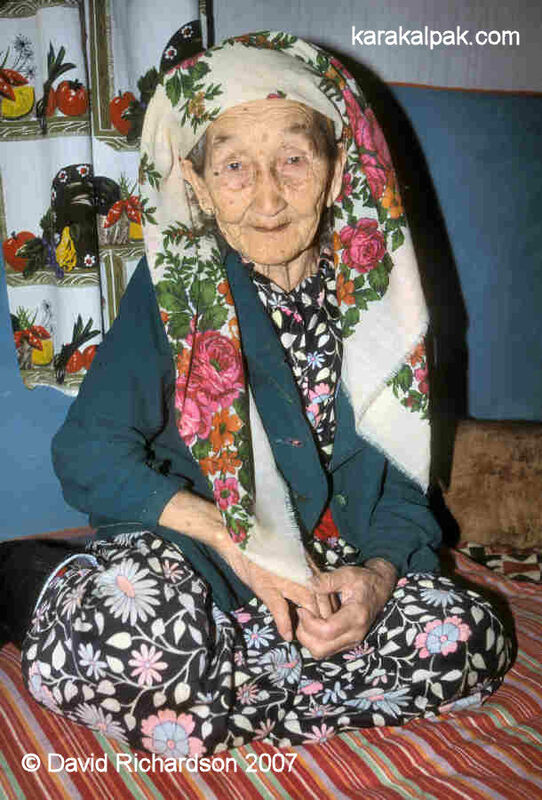 She is seen wearing a printed cotton ko'ylek, a modern Western-style jacket, and an old Russian kerchief. 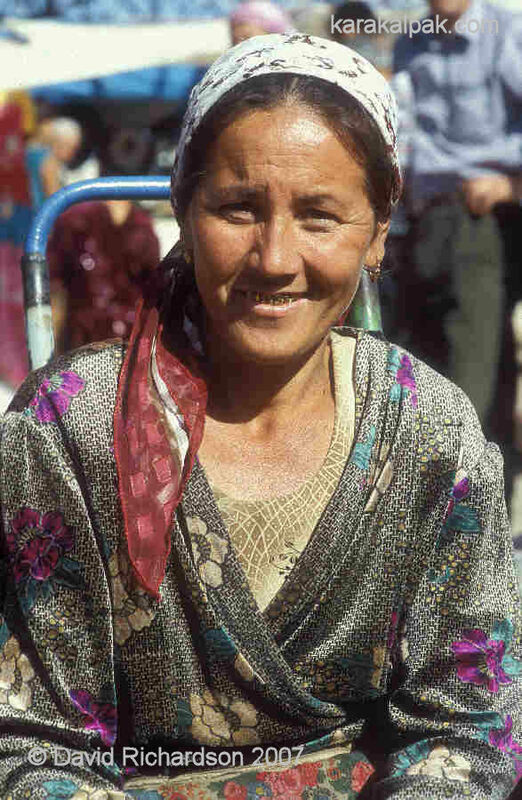 Karakalpak rural woman in everyday clothing in 2004. She wears the ubiquitous headscarf and a long-sleeved ko'ylek. 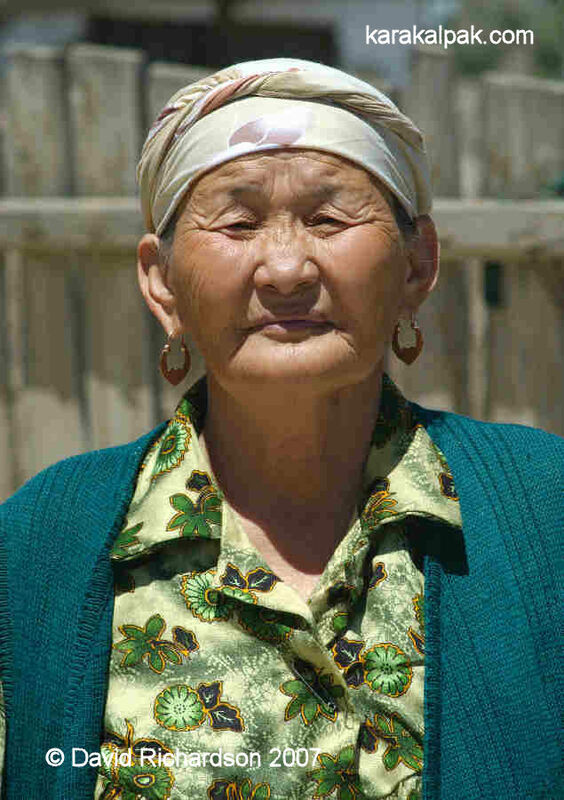 Karakalpak woman in everyday clothing in 2004. Her dress and overdress are made from synthetic printed textiles purchased on the bazaar. She wears a shiny synthetic shirt and a short-sleeved wrap-around grey dress. 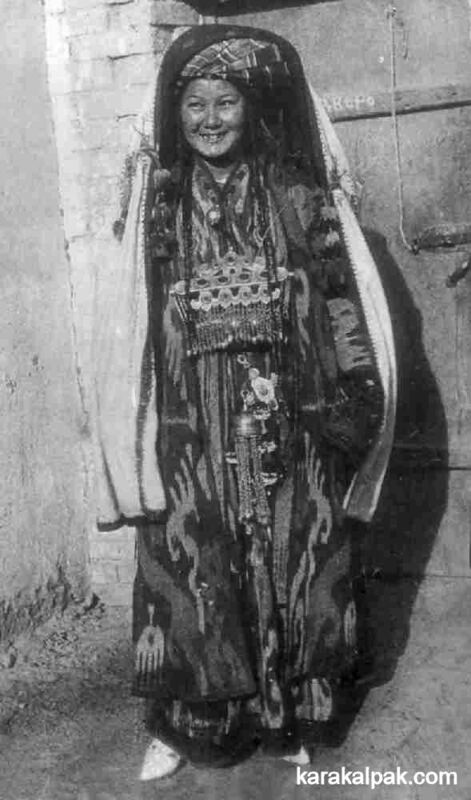 Karakalpak woman from Qarao'zek wearing a Western-style dress and cardigan. from the brightly coloured synthetic materials found on almost every bazaar. Mother and daughter at the Xojeli Sunday mal bazaar in June 2005. They are both wearing headscarves and imported footwear. The daughter is in short sleeves. Note that this is a temporary summary page. A full overview of Karakalpak female costume will be added in the future. This page was first uploaded on 6 March 2007. It was last updated on 1 February 2012.